Material Standard: ASME/ANSI : B16.47, B16.48, B16.36, B16.9, B16.28, MSS SP 95. We are offering Bulkhead Union Straight to our clients. 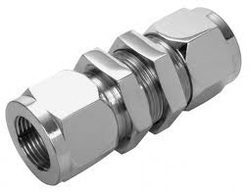 Our range of Union fittings find application in dairy, food and beverage industries, sanitary fittings pharmacy industries, light industries , machine industry and other related industries. 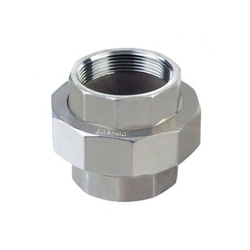 Manufactured from quality steel., these fittings are highly resistant to corrosion and are known for durable and reliable performance. Union is manufactured by using high quality material by our vendors. These types of valves hold international quality standards and are dimensionally precise. Moreover, these are durable and exhibit excellent resistance against corrosion. We make sure to offer these valves at market leading prices. We are the trader and supplier of bulk head union. Connection 1 Size: 1/2 in. Connection 2 Size: 1/2 in. To cater the variegated demands of our precious clients, we are highly engrossed in trading and supplying a wide range of Pipe Union. The offered Union Fittings are sourced from our reliable market vendors. The provided Union Fittings are highly appreciated by our clients for their optimum finish and easy installation features. Peek Finger Tight Fittings , ZDV Union Peek , ZDV Union S.S.